could be a "GABARIER" sailor in charge of steering a small river boat which job is to bring all the goods and impediments to a main ship. Also does anyone know what the left guy is? He kinda looks like an officer but why does he wear a scots greys bearskin cap? Last edited by lcm1; 06 Sep 17, 19:42. The uniform plate pictured is from the book The Thin Red Line by the Fostens published in 1989. The two central figures on the plate are infantrymen: a sergeant of the grenadier company of the 2d Foot in full dress on the left, and a sergeant of the light infantry company of the 3d Foot in service dress on the right. The plate is on page 45 of the book and is numbered as Plate X. The commentary explaining the plate is on pages 44 and 47. The title of Plate X is: 1812-1815 Infantry of the Line: Flank Companies: Non-Commissioned Officers and Privates. The figure in question is wearing a grenadier fur cap and is carrying a spontoon, which is his badge of rank along with the waist sash and the full dress sword. The book itself is excellent but, curiously, does not have any uniforms depicting units in the War of the American Revolution. I thought that odd, as it does have uniforms of the French and Indian War/Seven Years' War period. The cheapest C.E. Franklin book I have found is selling for £135.00 on Abe Books. Last edited by Dibble201Bty; 06 Sep 17, 20:57. Cool thank you! Still hard to find anything "cheaper" on the british army that covers that much stuff. It's hard to come by this information but there are 3 distinct cavalry regiments that have different symbols on their helmet and or shabrack: the Chevalier Guard, the Lifeguard Horse Regiment, and the Military Order Cuirassier Regiment. 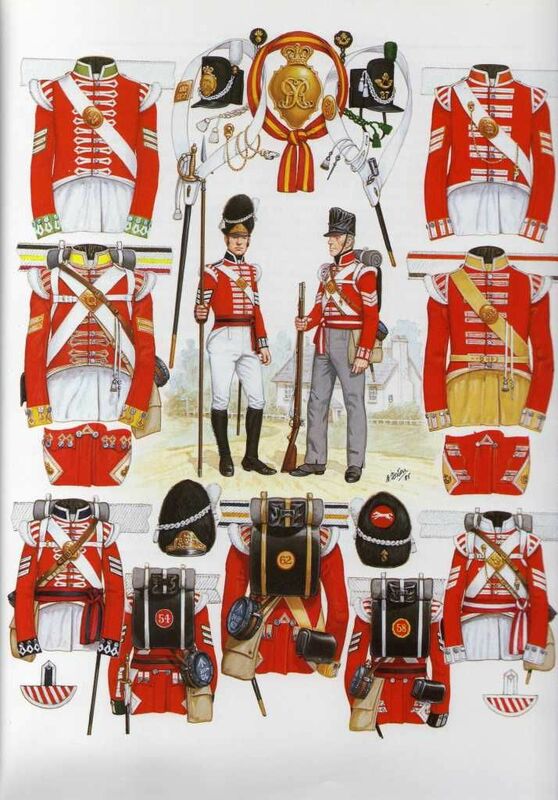 In 1813 the His Majesty Life Cuirassiers (Line) were promoted to young guard status as the Lifeguard Cuirassiers I think somewhere at that time or later the Her Majesty variant of the cuirassiers was also promoted. The book of Alexander Viskovatov describes the helmet of the Line Cuirassiers as having a double headed eagle on it. Did the His/Her Majestys Cuirassiers get a new helmet with the guard star after the promotion to the guard? They seemed to already have the star on the shabrack but on newer stuff they had the Imperial Monogram on it. Also, does anyone have any plates or pictures of the Chevalier/Horseguard Helmets? They seem to have a Guardstar on the Helmet. Does anyone know the Uniform and color difference between the Russian Old Guard and Young Guard Heavy Cav? Their Facings and Shabracks seem to have the same color? Also, something I don't quite get are the Life garde Cossacks they are part of the Imperial Guard but some websites mention Lifeguard Ural,Black Sea etc Cossacks as line Cav. What are those? Are they also "Red" Guard Cossacks or are they like the normal cossacks? I am not as good with the Russian army as I am the British, French etc. But I'm sure that someone may be along and answer your questions. Have a look through these sites. Last edited by Dibble201Bty; 08 Sep 17, 08:54. Thanks and good catch. And, yes, of course, the error was unintentional. Why would it be otherwise? I am Working on some 28mm British infantry from the Waterloo campaign. I am painting them as the coldstream guards however I've ran into a problem. how are the flank companies distinguished from one another, the models have shako covers so the plume isn't present and as far as i know the light company and grenadier companies wore dark blur facings the same as the centre companies. If they all have shako covers you should perhaps have an officer or senior N.C.O without a waterproof covered shako on both flanks to symbolise the Grenadier and Light companies. Centre companies had blue edged white lace shoulder-straps with a white tuft at the end. From 1809, The Flank companies had blue edged white shoulder-straps with elite blue laced white crescents with a white fringe on the outer curve. click on the link below, then scroll down to a 1/6th scale model of a Coldstream Guardsman. It is a very good depiction. I have been collecting information on French Napoleonic Era infantry uniforms for some time and have previously seen a photograph of the reverse of a voltigeur habit long of the 121st Ligne which I am pretty certain showed different turn back badges on either side. I have recently been trying to find this picture again but can only locate a side view. Does anyone have a link to a back view of this habit? I also note in these forums a reference to a habit of the 116th, I would appreciate a link to this if anyone has it. Thanks. scroll down to the second group. All times are GMT-5. This page was generated at 15:25.